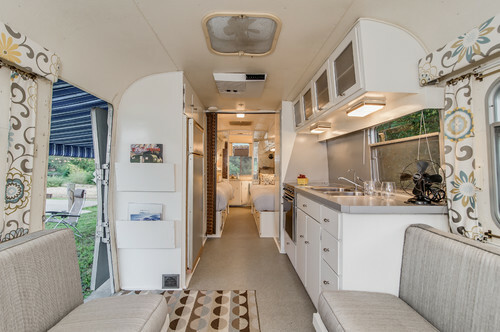 This first RV, as you can see, is an older model. 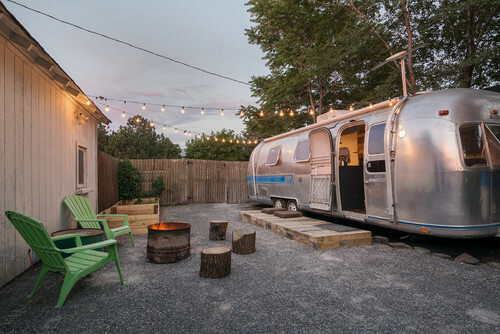 It is a 1976 Airstream that has obviously had an update. 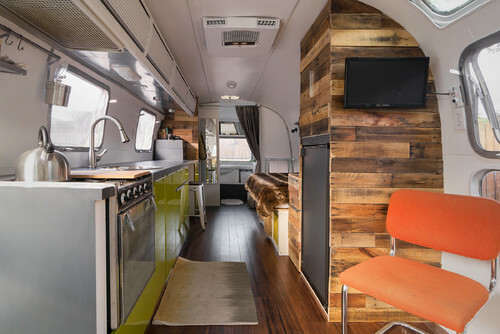 You’ll notice that this RV comes complete with a small porch (made from wood planks), a raised veggie garden, a fire pit and side table (made from an old barrel), and extra seating made from split logs. I really like that they recycled old materials. On the inside, you can see that everything has been overhauled. 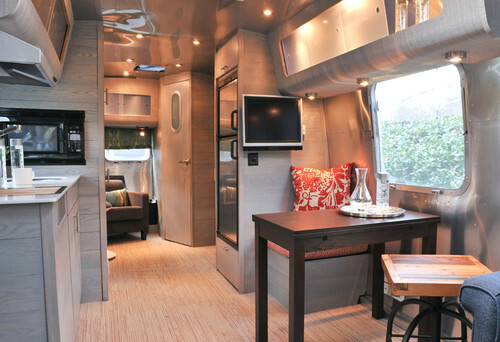 Once again, wood planks have been put to good use to create a surround on one side of the RV. The plank wall also makes a good backdrop for the TV. 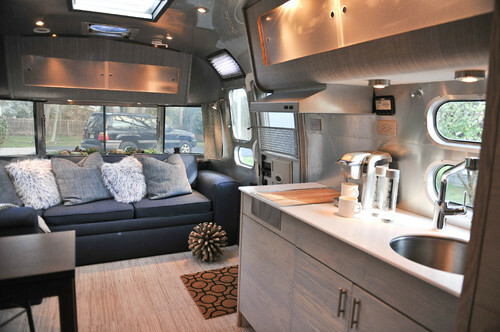 If you look from the opposite side, you can see how the kitchen counter top extends almost the full length of the RV. 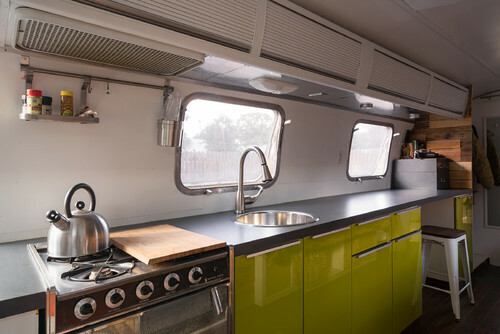 This not only provides plenty of prep space for cooking, but also serves as a nice bar top for eating, and a good desk space for work. A closer look at the kitchen zone shows that they have a full cooktop and oven, along with a reasonable sized sink. Notice how they mounted a rod above the stove from which to hang items. 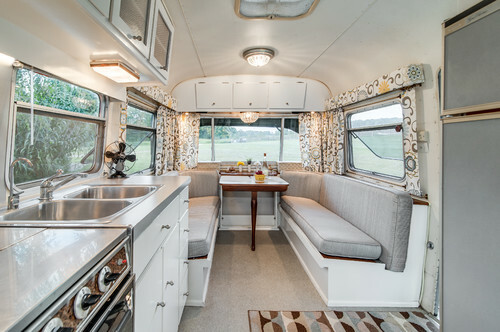 This little beauty is a 1972 Avion Camper. The remodel on this one didn’t stray too far from the original style. But, sometimes a good result comes from just picking and choosing which pieces need to go, and which pieces can stay. Obviously, flooring would be a necessity in most remodels. You want to get rid of the worst of the worst, and generally that means the floors. Another easy and inexpensive update can be had with the superficial aspects, such as the draperies. These are new, but still have that 70s vibe. In the kitchen zone, they were able to keep the old appliances and lower cabinets. However, the upper cabinet doors are new. By exchanging the old cabinet doors with an acrylic inserted door, the space looks more modern and open. 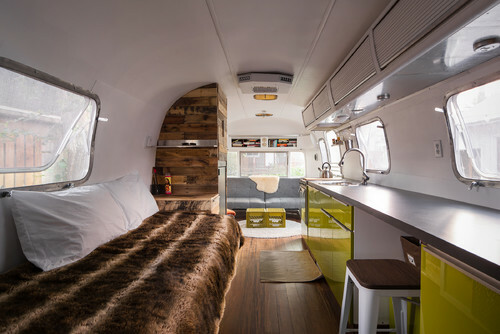 This Airstream has a lot of modern day technology added to it. As you look across the kitchen area, you will notice the built in microwave situated just above the sink. Further back is a small office area. 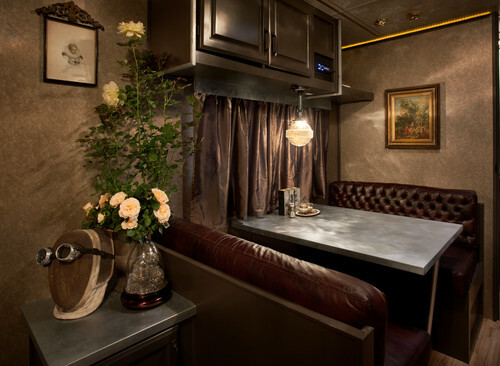 The opposite side of the kitchen area shows that this RV is equipped with a full functioning refrigerator and a TV. Also notice that the upper cabinets have lighting that really helps to expand the area visually. 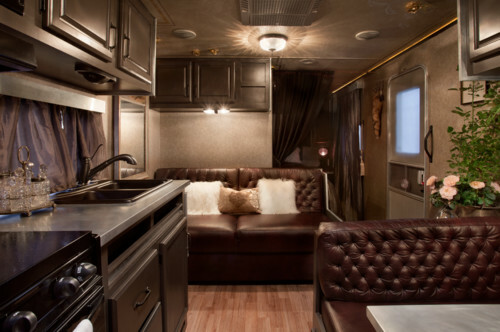 If leather is more in keeping with your taste, then perhaps this remodel will impress you. 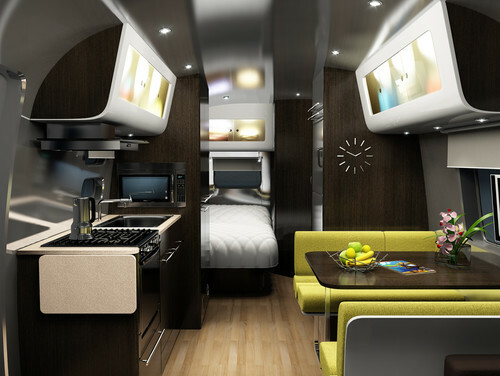 This RV looks like it was designed with the “man cave” concept in mind. However, they did add a few feminine touches here and there – the crystal, flush mount, light fixture and the potted pink roses, for example. For the design, the walls panels were removed and a metallic vinyl wall covering was added. Modern cabinets in a dark chocolate finish was added along with a nice counter top, which houses the double sink and oil rubbed bronze faucet. 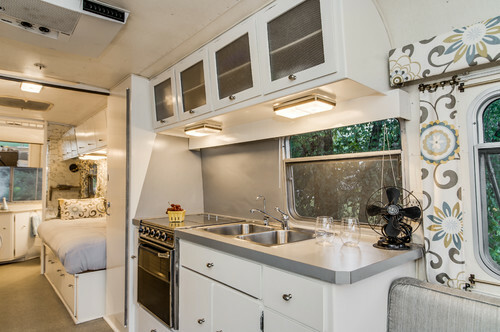 This RV appears to have retained some of the old elements (cabinet and seat covering) but have added several modern elements, as well. The flooring is a scraped plank in a walnut finish, and the countertops have been exchanged for a new granite. 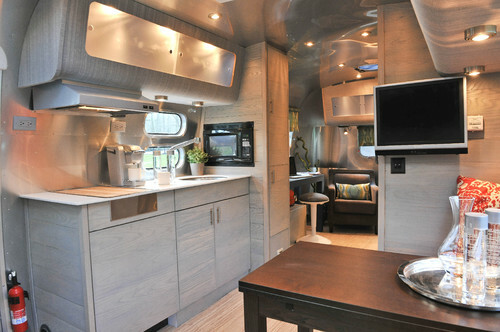 I have to say that this is one of my favorite RVs, but to be fair, I must admit that it is not a remodel. It is, in fact, a new design that has the look of days gone by. This one is definitely meant for comfortable travel. But, if Mid-Century style is what you love, you could recreate something like this with a modest budget. The reverse view shows a nice size sofa that has additional sleeping space below. Although the countertops are a solid surface material, the appliances are definitely modern. This blend of old and new style is something that I like to see. 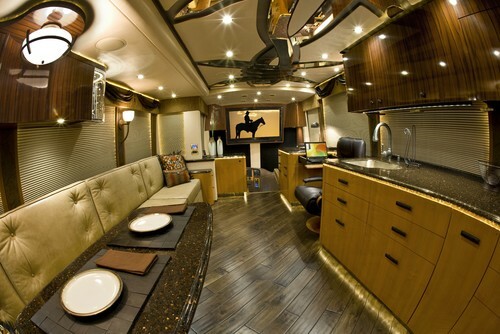 I hope that these RVs have gotten all of you RV owners’ creative juices flowing. I know that many of you are in love with the tiny house movement, and just wanted to provide you with some nice alternatives.